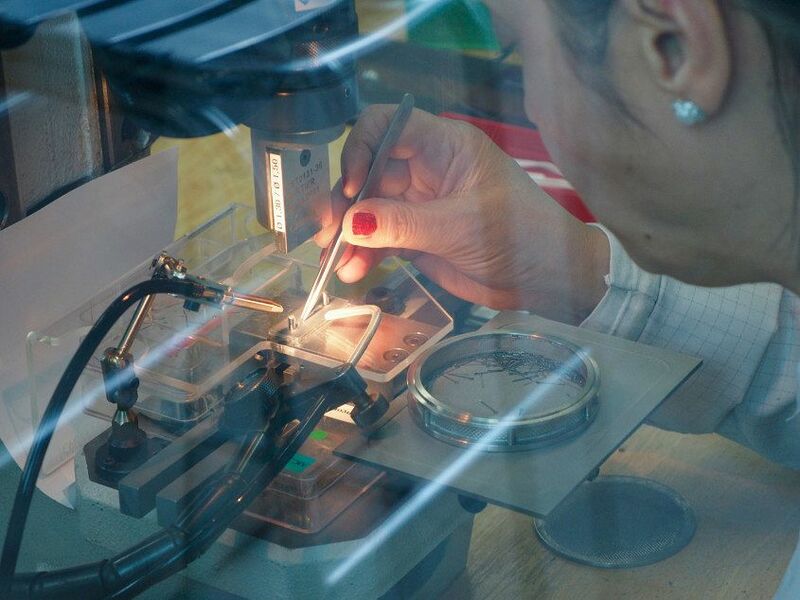 Author’s Note: It was a cold day in March, earlier this year, when we paid a visit to the home of Cartier to understand how its new watches are developed and to see key aspects of the manufacturing process. We came away with a clear appreciation for the balance of technology and craftsmanship employed at Cartier – the very latest manufacturing technology often sits right alongside traditional manual watchmaking skills. It was quite a day. We’re excited to share this with you, any thoughts or comments please contact us. Cartier is synonymous with Paris. A quick glance through the brand’s history shows you that it is as much a story about the emergence of a boom city during the Belle Époque era of the late 19th Century as it is of the eponymous company founded by Louis-François Cartier in 1847. But despite this link, some of the most innovative Cartier products are created far from the romantic French capital. 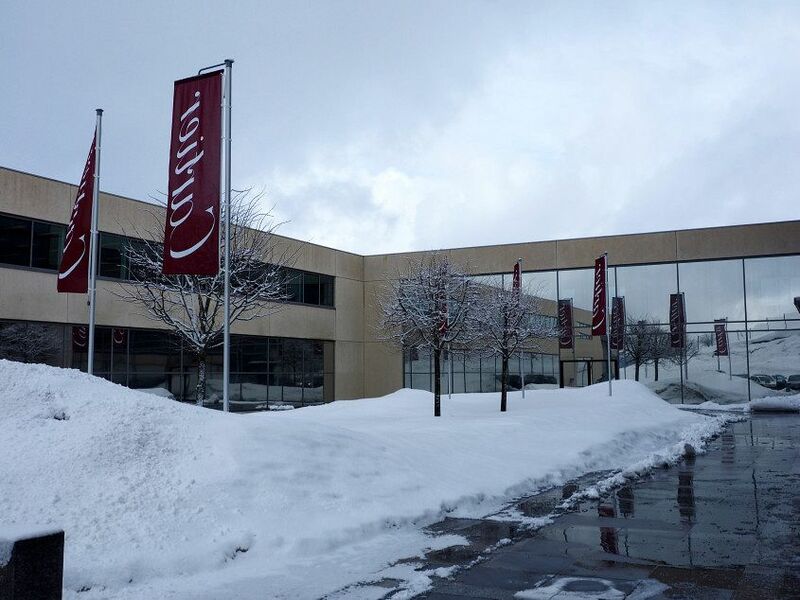 Welcome to Switzerland – home to Cartier’s flourishing watch business. 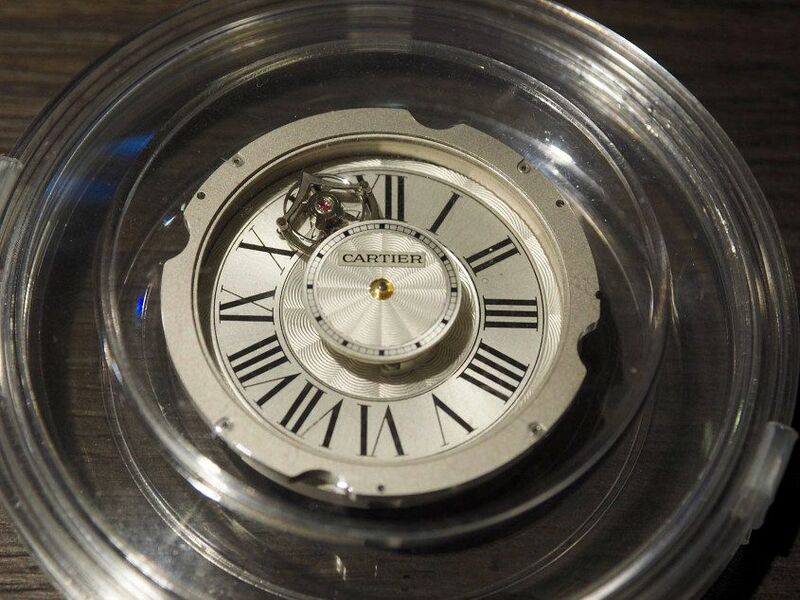 And we do mean flourishing – in terms of turnover Cartier are one of the watch industry’s biggest players. Towns like La Chaux-de-Fonds are why we think of Switzerland as something straight off a chocolate box lid. It’s a picturesque part of the world, but make no mistake, inside the quaint buildings and cutting edge architecture, you will find people industriously making watches and army knives. Take a drive down Rue Louis-Chevrolet (yes, that Chevrolet) and you’ll drive past TAG Heuer, then Breitling before hitting the main road that leads to Cartier’s impressively modern factory. Across the road from Cartier is Sellita, the movement manufacturer. Girard-Perregaux, Corum, Ulysse Nardin and Bell & Ross are also in town. 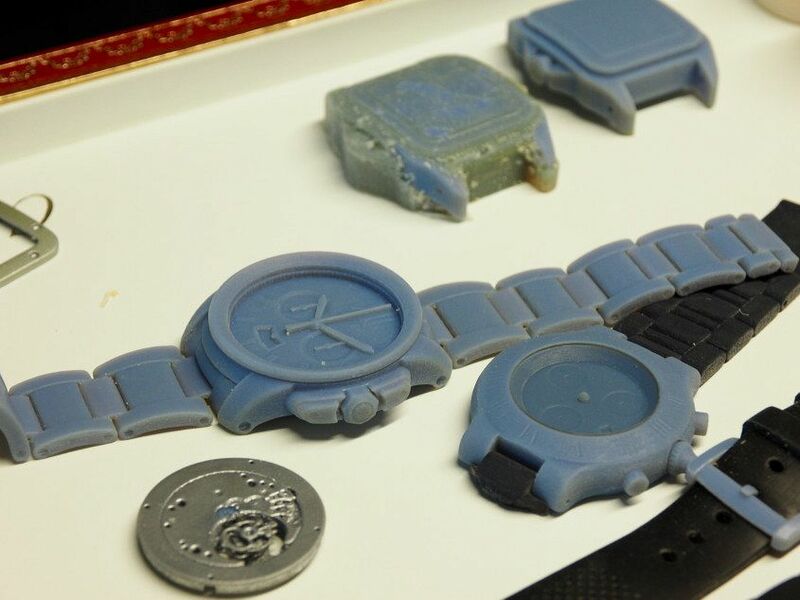 It’s Disneyland for watch lovers. But despite having one of the largest presences in the town, Cartier is a relatively recent arrival to the region. It didn’t take Monsieur Cartier long to produce his first wristwatch, with the first model launched in 1853, six years after the company was founded. 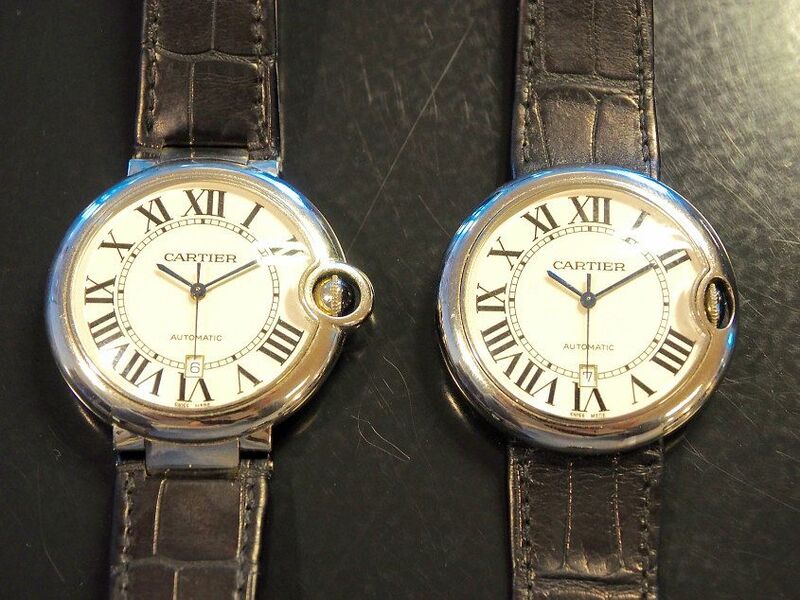 Back then Cartier was what is known as an établisseur, which means a manufacturer who designs and makes its own cases, but buys in movements from other specialists. This was standard practice in the days before vertically integrated manufacturing. 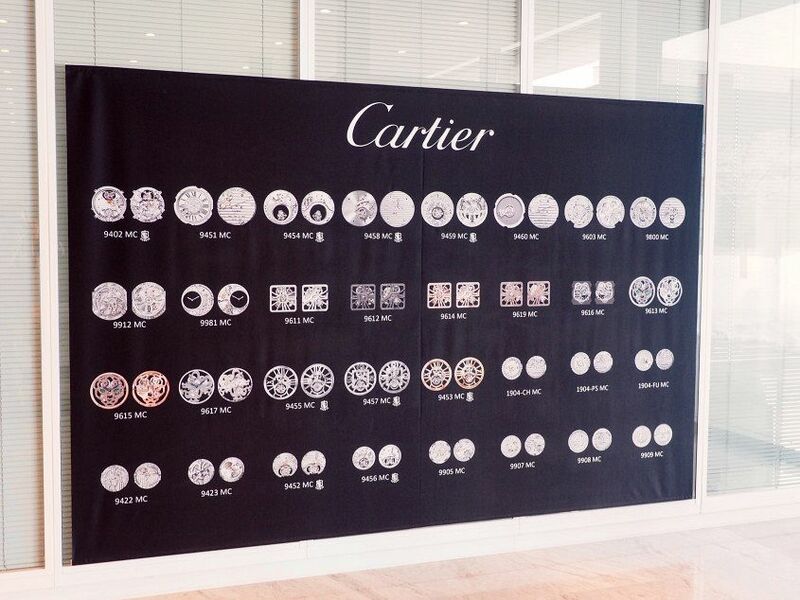 Cartier made sure it bought from the very best – Jaeger-LeCoultre, Audemars Piguet, Patek Philippe and Rolex all supplied movements to Cartier. Cartier wasn’t content to merely make the cosmetic components of the watch; the spirit of innovation was there right from the start. In addition to releasing the Santos – the first commercially produced wristwatch in 1911, they also innovated on other aspects of the watch. The deployant “folding clasp” that you see on many watches today? Cartier invented that in 1910. Cartier’s modern focus on watches began in 1977 when it was decided to seek out an industrial partner in the heart of Switzerland, eventually choosing Ebel. 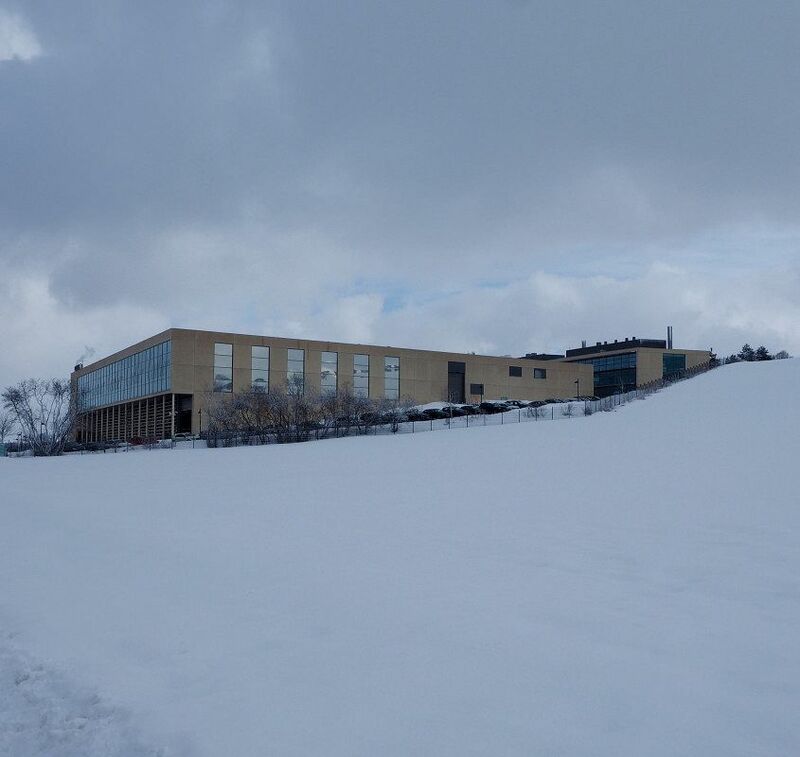 As Cartier’s business grew, they bought Ebel’s watchmaking business as well as a range of the smaller suppliers throughout La Chaux-de-Fonds to consolidate watchmaking at the new factory that opened in 2000. 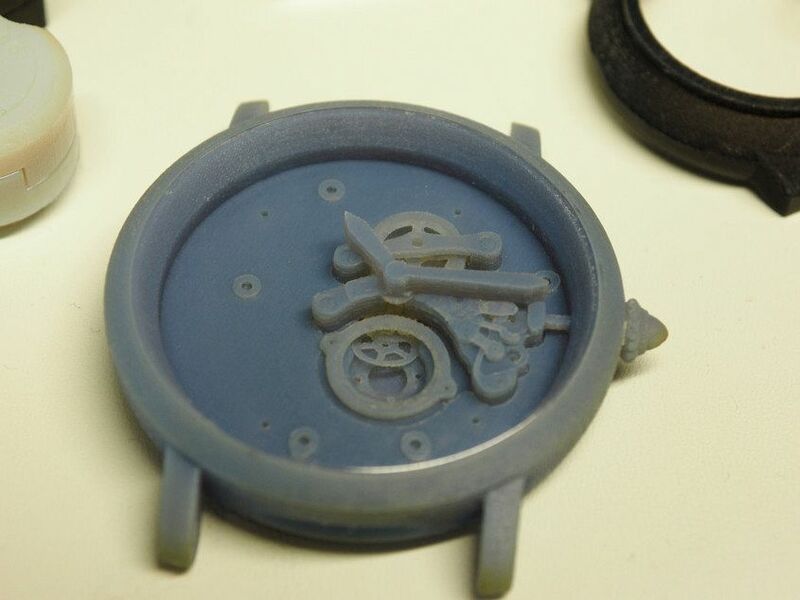 And it was here that the next major step was taken- to become a full manufacture and design and produce watch movements, the first being the Ballon Bleu series in 2008. 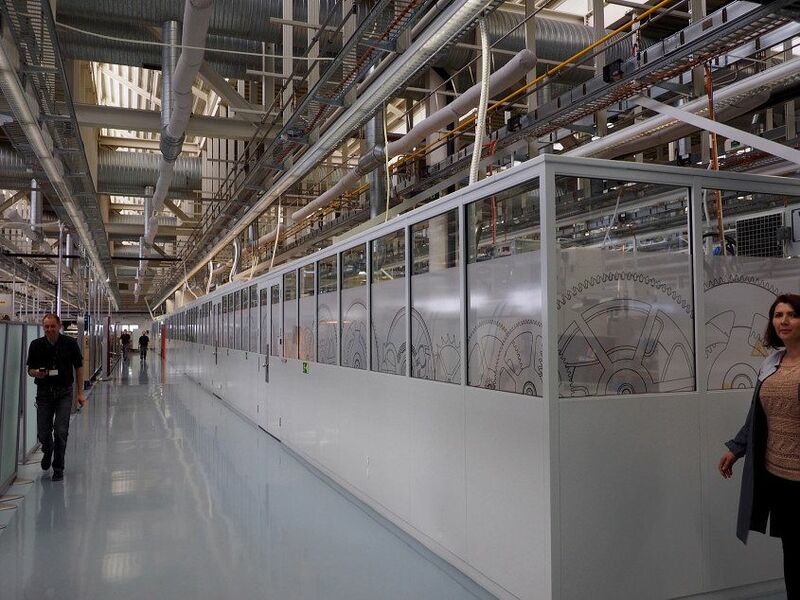 The Industrial looking facility draws its inspiration from advanced car manufacturing plants. As you can see, each site has its own speciality and together they cover the full range of parts and components that go into making the brand’s range of quartz and automatic watches, as well as the hand-made haute horlogerie masterpieces. Weather is no better at the main entrance- where’s the sun? CAD technology widely employed in the development stage. 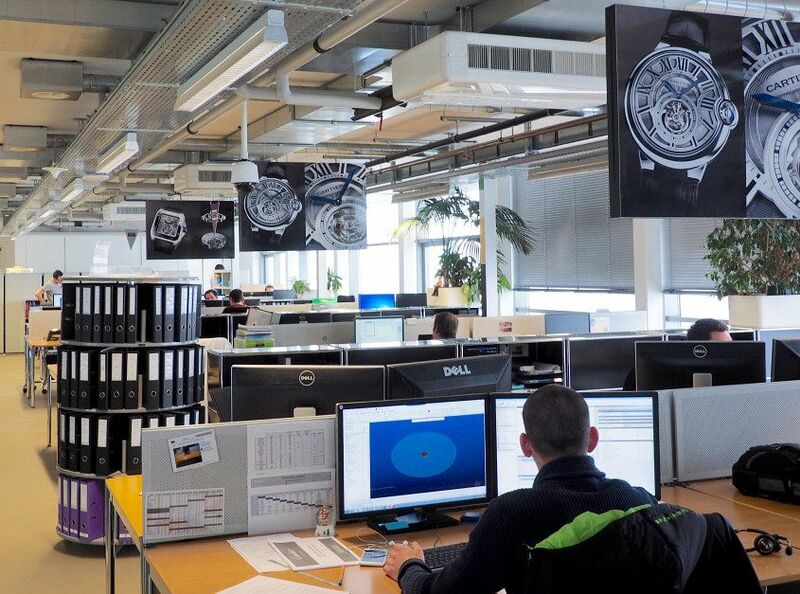 The development team is responsible for designing all new watches. As we walked in with our camera, computer screens were quickly changed from working on the next big thing to showing 3D drawings of existing models – secrecy is paramount. The process is a lot more involved than simply designing a pretty watch. This team also designs all of the components inside the new design, as well as any new tools that need to be created to make those components. Computers simulate which parts will wear and after how long, meaning that all the hard design work is done before a single part is stamped in the metal. The most impressive part? This team also work out how tightly every screw should be tightened, which is then specified to the watchmakers assembling the parts. Once a virtual design has been signed off, the next step is to create wax models using the 3D printers, such as the one below. What do you mean “Toner Low”? 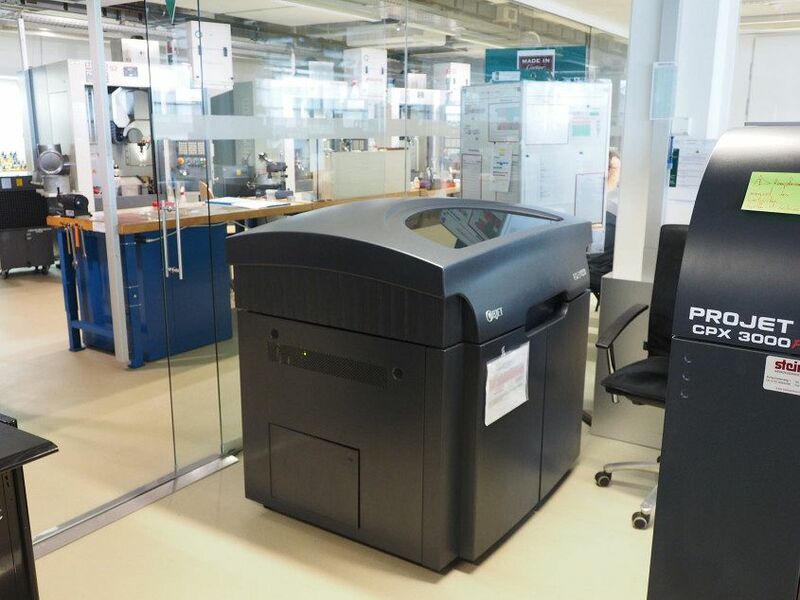 These printers are impressive pieces of hardware and can print an entire watch- including a bracelet with movable links – in a single print. Even complex dial designs can be produced. It’s an important stage, because no matter how good the design looks on the screen, this is the first chance that a designer has to assess how the new model sits on the wrist. One of the highlights of the visit was the chance to see alternative design proposals for Cartier’s best-selling series- The Ballon Bleu. Cartier claims that if Ballon Bleu was a watch brand rather than series, it would be the fourth largest Swiss watch brand ranked by sales. 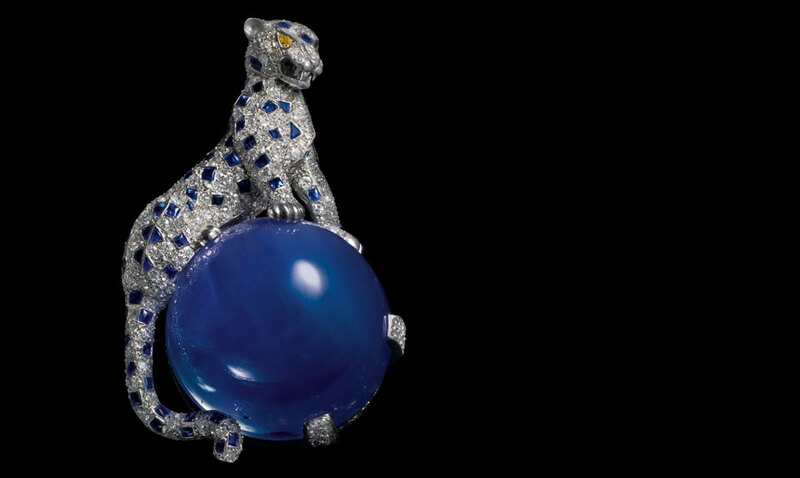 The Ballon Bleu (“Blue Balloon” or “Blue Ball”) refers to the blue sapphire-tipped crown that has become a Cartier tradition. The heritage stretches back to the famous Panther broach made for the Duchess of Windsor, where a jewel-encrusted Panther sat on a blue ball. You can see that the watch on the right below has no lugs and a crown guard far more integrated than the final design. The watch on the left is not the final design, but much closer to the watch we see today. 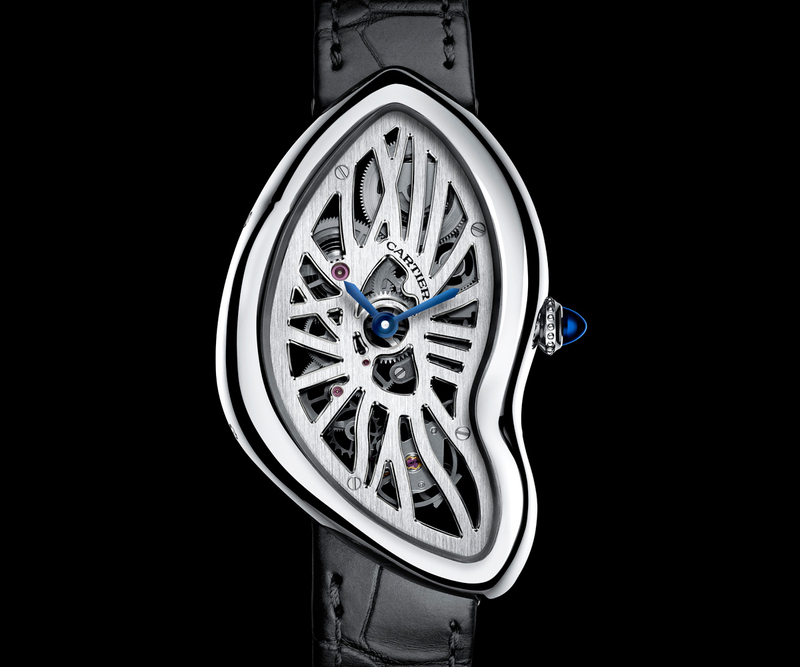 Having seen the technology used to develop Cartier’s watches, the next stop was at the other end of the spectrum, involving the art of creating a curved watch crystal, one that has largely been abandoned by most manufacturers. 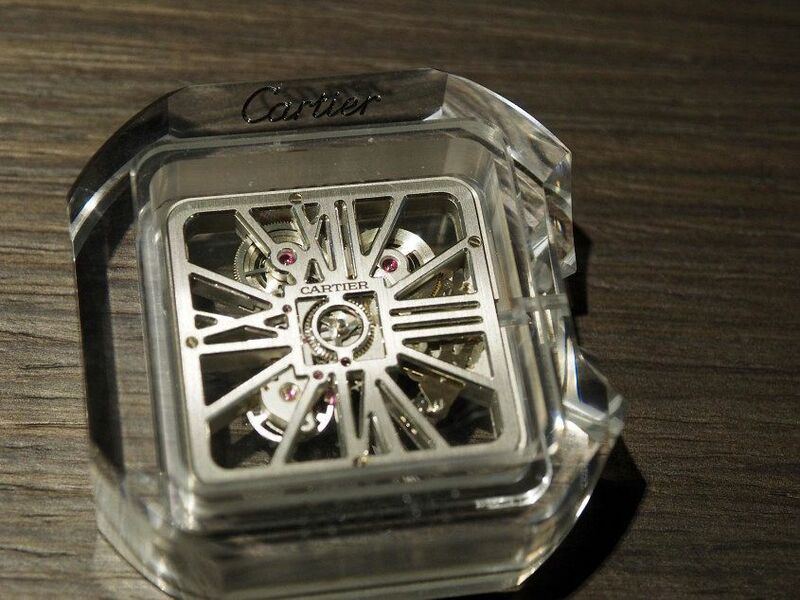 Cartier fits these hand-made crystals to models such as the Crash range. Yes, sapphire crystal is preferred for flat surfaces, but if you want curves, then you have to use mineral glass. These crystals are made by taking flat piece of glass and placing it on top of a mould. That mould is then rotated under a bright flame, which heats the crystal to 600 degrees, melting the glass into the mould. This is an incredibly delicate operation and it’s very easy to end up with a pile of useless broken pieces of glass. 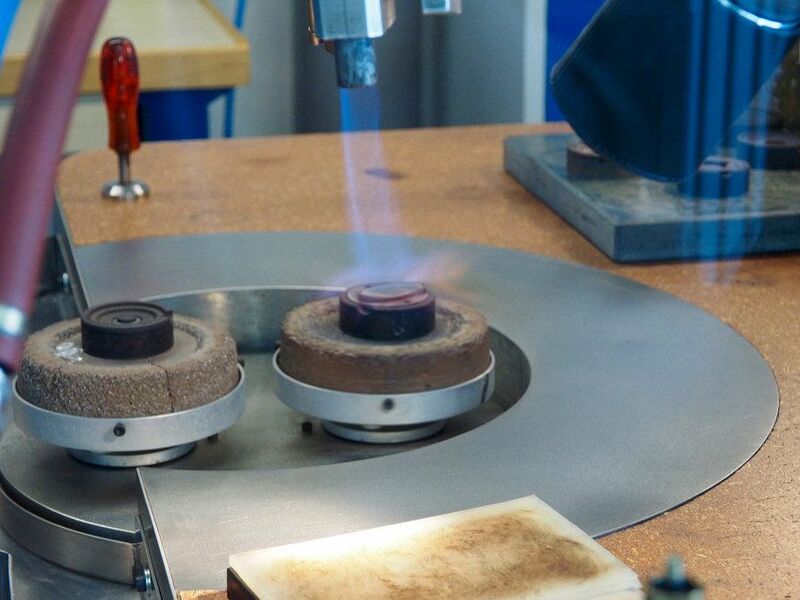 From this stage, the crystal is then hand polished before it’s ready to be fitted to the case. The theme of technology and craftsmanship extends to the humble bracelet link. 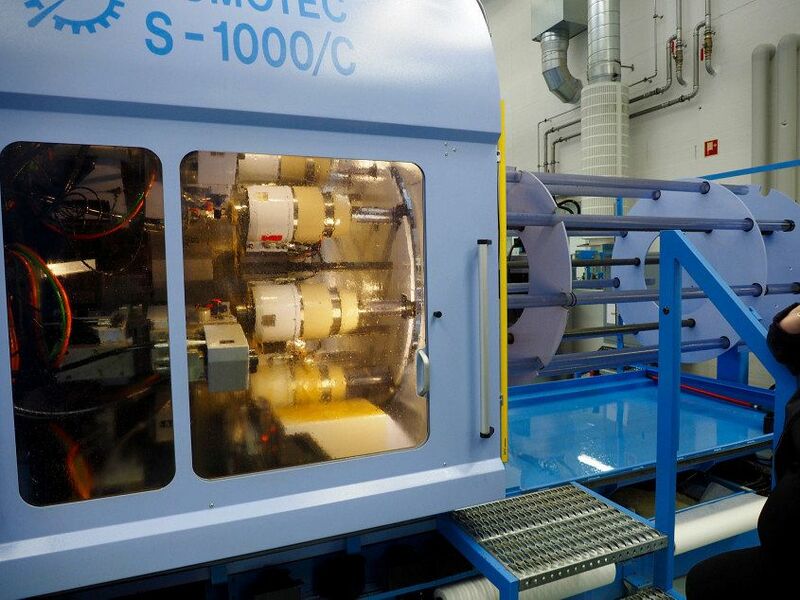 The first steps are pure machine- solid gold rods are inserted into a CNC machine which machines the raw links. 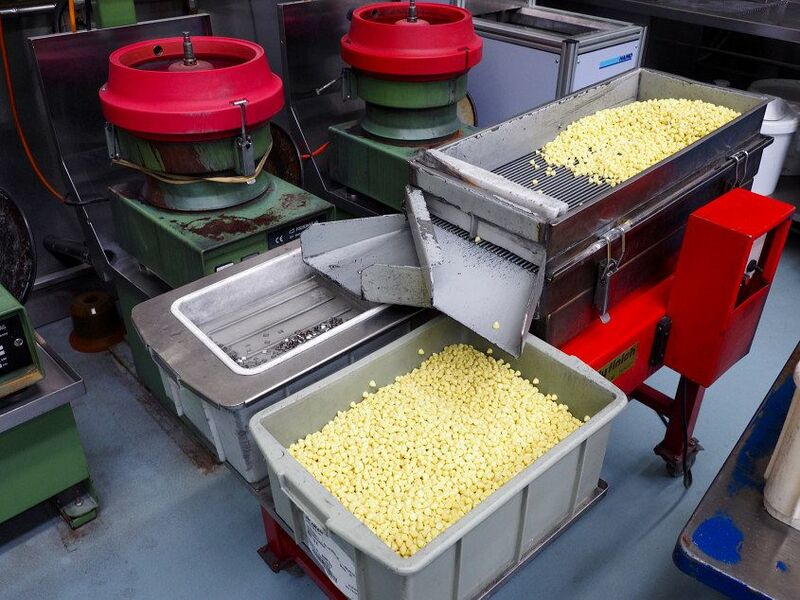 These links are then given a preliminary polish in a tray of yellow ceramic beads. But from here, man takes over. 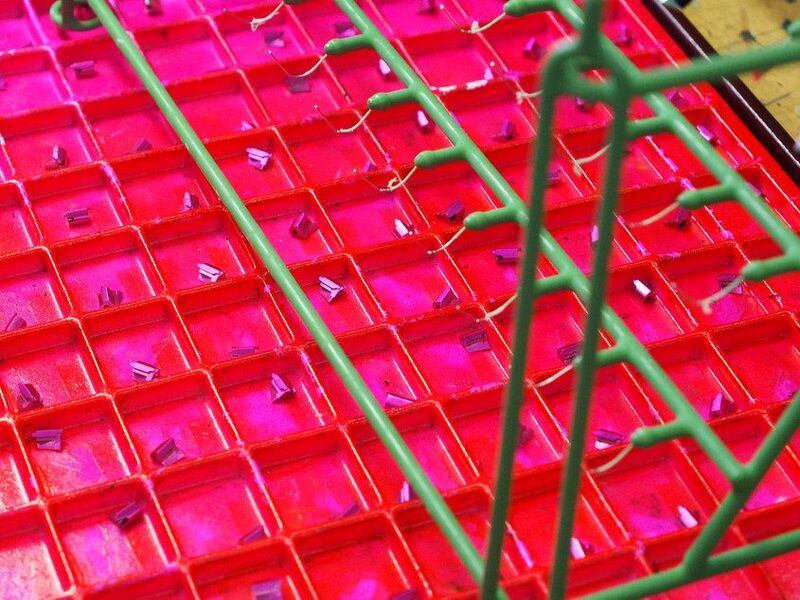 The links are painted pink before being polished by hand. Every. Single. Link. The reason for the coating is so that the polisher knows which surface has been polished and which hasn’t. 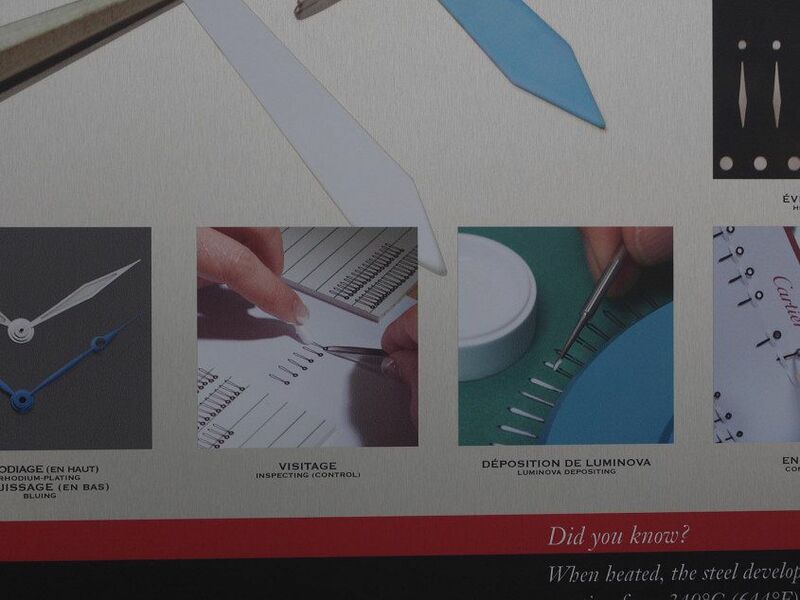 The same process is used for polishing watch cases, as you see below. The final polish is often done entirely by hand with polishing paste and no machines at all. 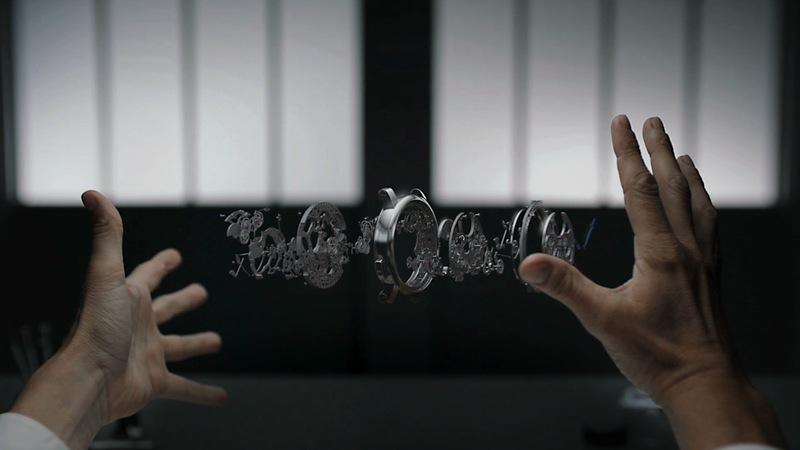 Hands are one of the most delicate parts of a watch and of course one of the parts most on show. They are initially made by stamping metal, but again, the hard parts are all done manually, including shaping and polishing. Oh, and the luminova on the hands? All painted by hand. We’ve only told the story of small elements of the manufacturing process, but each of which highlight Cartier’s watchmaking philosophy, and again it comes back to this fusion of technology and traditional watchmaking. Yes, the brand uses advanced technology, but only for the design and what we’ll call the initial manufacturing stage. But what sets these watches apart is the finishing, and that is done by hand. 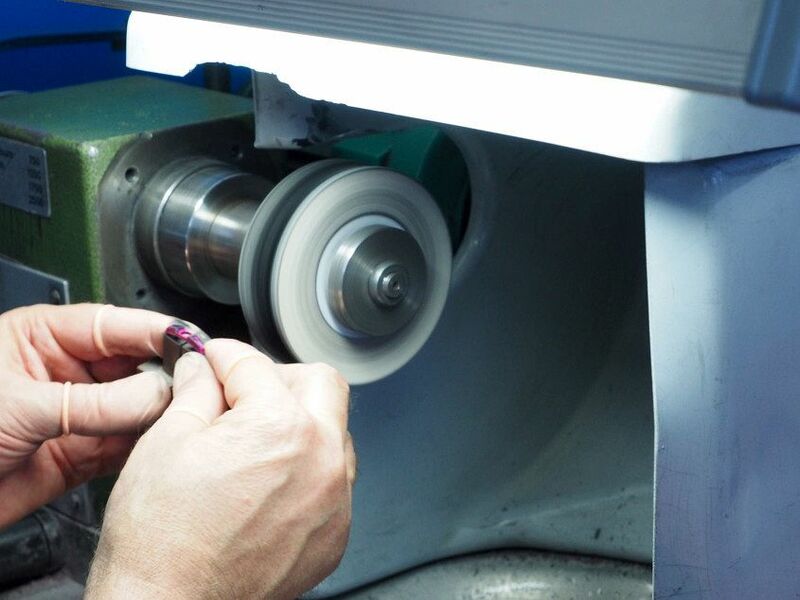 You come to appreciate the sheer time that goes into making a watch and of course the skills of those who make them.